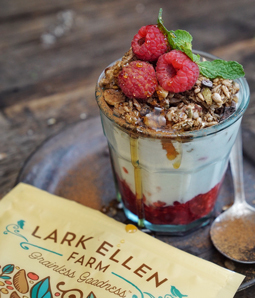 Raspberry Coconut Parfait with Lark Ellen Farm Bites - A recipe from Savor California, the online showcase for extraordinary gourmet foods and beverages from California. Blend raspberries, banana, and honey together. Set aside. Stir the yogurt, coconut, and vanilla together. Set aside. Fill glasses or jars 1/3 full of the raspberry mixture. Add a layer of the yogurt mixture, leaving about 1 inch at the top of the container. Top with Lark Ellen Farm Organic Vanilla Cinnamon Grain Free Bites. Dust with cinnamon and drizzle with honey. Top with fresh raspberries and a mint sprig, if desired.